Casa Vieja is a luxury all suites boutique hotel situated in the exclusive area of Polanco, just steps away from well-known museums, galleries, restaurants, high-end international boutiques and the financial center.Once a private residence, Casa Vieja was created with luxury lifestyle in mind and is now considered the most unique boutique Hotel in Mexico City. This beautiful property is decorated with arts and crafts from all over Mexico, and offers full amenities and superb personal service.Casa Vieja Terrace presents traditional Mexican as well as international cuisine with daily specialties personally chosen by the Chef.Casa Vieja is located on a quiet street in the elegant Polanco district, next to Parque Polanco with its lovely ponds, statuary gardens and occasional concerts and art exhibitions. Polanco also has some of Mexico City's finest restaurants, boutiques and galleries, as well as vibrant cafe society and nightlife.Within close walking distance are important museums, multinational headquarters, and the section of the tree-lined Paseo de la Reforma avenue where three of the city's finest large, "conventional" hotels are located.The decor is a never-ending discovery of caringly collected antiques, fine art, and regional craftwork from the most remote villages of Mexico. 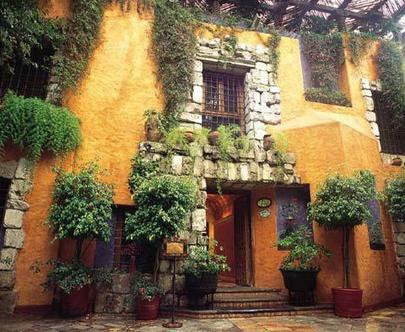 Quarry-stone floors and thick walls create soothing seclusion and tranquillity -- an amazing hacienda retreat within the center of one of the world? ?s biggest and most exciting capital cities. Located in the exclusive neighborhood of Polanco, just steps away from the most exclusive restaurants, boutiques, museums, Santa Fe shopping mall and financial district.